This means that, without massive repetition, and without a lunge to the West Coast that isn’t particularly practical, our tours will now be much less grand. So it was this year, but despite having less marquee value, it was still a highly entertaining and instructive time. Only one was a major league game. The Barons and Smokies are in Double-A; the rest are in the Low-A South Atlantic League. This isn’t an impressive lineup at first glance. I anticipated that, for the first time, I would not be writing up the tour for The Hardball Times. As usual with these events, though, I reserved judgment: Postmortems are dangerous before the games are played. This was wise. I ended up having a lot to say about what I experienced on the road this year. I have a stadium review that may be surprising. I have a night in the minors that will spark some nostalgia and might have triggered a rush to the video store if such things still existed. First, though, I should tell you what I learned in the minors. I didn’t begin the tour with preconceived ideas of what material to write up. Themes have to emerge on their own, like the internationalism of the National Pastime did on our trip last year. Those themes don’t announce themselves at their first appearance, either: It requires a pattern, not one incident. (A big enough incident could fill an essay by itself, but that didn’t happen this year.) That’s why it took three games for me to conclude that minor league teams had shifted toward emphasizing their links with their major league parent teams. The title of this section admittedly comes from me being cutesy with corporate buzzwords. “Vertical integration” is when a company owns several production or distribution steps in the creation of its end product or service. Major league teams are invested figuratively in their affiliate clubs but usually not literally, in the sense of owning them outright. It’s that figurative investment, in the form of closer identification of the lower team with the higher, that is on the upswing. Historically, it hasn’t been a great idea for the minor league teams to get too invested in, or identified with, their parent clubs. Affiliate switches, out of a farm team’s control, could sever those bonds at the parent’s convenience. My own research, however, has shown this is happening much less frequently today, at least in the high minors. This may have paved the way for greater willingness to link those affiliates with their big-league parents. This tendency doesn’t start at the ballpark for the Tennessee Smokies, the first club we visited on our trip. It begins on the homepage, where the background banner proclaims the team “Double-A Affiliates of the World Champion Chicago Cubs.” While the Cubs passed their crown to the Astros eight months ago, the pride and the banner persist. A linkage of this type surely isn’t rare, but the equivalent of leaving one’s Christmas lights up until mid-January caught my eye. The most visible connection is the most visible team logo. The Smokies have several, the better to ring up added merchandising sales, but the most prominent is a blue bear’s face in a red circle on a white background. The colors are reversed from the Cubs’ famous logo, the red “Cubs” inside a blue circle, but the brain instantly links the two. Such identification wasn’t new to my experience. I saw similar things two years ago when we attended an Oklahoma City Dodgers game, then in just its second year as the Los Angeles Dodgers’ Triple-A affiliate. The similarity in uniforms and the images of L.A. Dodgers on the concourse (including Vin Scully, still calling games) felt natural, perhaps moreso because the team bore the name “Dodgers.” Having the Smokies identify so closely with the Cubs was a little more jarring. It turned out I hadn’t seen anything yet. Two days after the Smokies walked off a win against the Birmingham Barons, we found ourselves in Greenville, South Carolina. 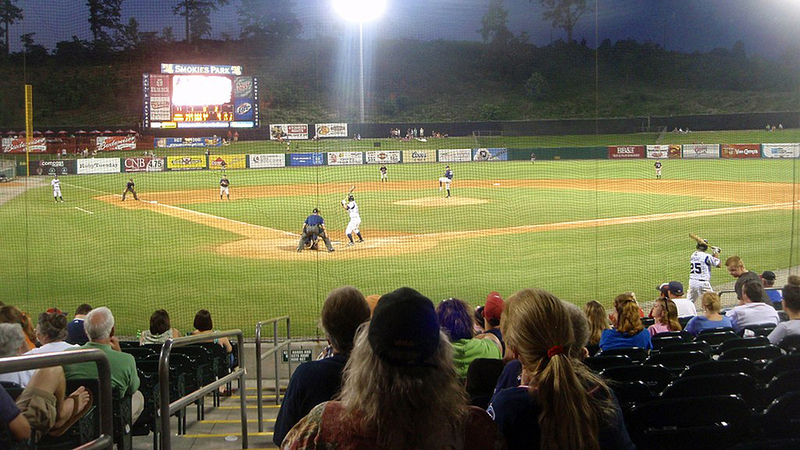 The Greenville Drive play in Low-A, two levels below the Smokies and three below the OKC Dodgers. They’re an affiliate of the Boston Red Sox, and they will not let you neglect this fact. The large baseballs at the front gate, one sporting the logo of the Drive and the other the scarlet B of the Red Sox, are your introduction. Next is the team store, loaded with nearly as much Boston merchandise as Greenville. That merchandise moves, as demonstrated by not only Drive fans, but Drive employees, frequently wearing Red Sox caps. If you want hot dogs along the left-field line, you’ll be going to Splendid Splinter’s, named after Ted Williams. If ice cream is your craving there, the place is Sweet Caroline’s. And yes, just like Fenway, they play and sing along with “Sweet Caroline” in the middle of the eighth inning. But if you want true commitment, something bigger than a concession sign, look at Fluor Field itself. Opened in 2006, the field’s dimensions are a duplicate of Fenway Park, including the sharp bend down to the Pesky Pole in right. A Green Monster towers over left field—though it’s a mere 30 feet tall compared with Fenway’s 37-foot-2—and houses a manual scoreboard. They don’t have the very short fences in right field that bring front-row fans right to the action, but since Fluor Field doesn’t have seating there, it’s an understandable modification. Adding to the homage to Fenway Park, there is seating atop the Grenville Monster. (That’s my personal nickname for it, though I have to assume I’m about 12 years late coming up with it.) There is one line of seats at the top of the wall and a row of tables seating four apiece on a level set behind it. These seats were installed before the 2017 season, improving what is already a very fine ballpark for Low-A, and are the priciest in the house. Naturally, I bought two. Paul and I saw a game at Fenway three years ago from atop the Monster (in the standing room above its seats), and we needed to complete the set. There we perched, in very nice fold-down, swiveling seats, Paul in his newly bought Drive hat, I in my trusty New York Yankees cap. Hey, if Bucky You-Know-What Dent could brave sitting in Fenway’s Monster Seats for a game, this rather less prominent Yankees backer could flaunt his team’s cap at Fluor Field. What was the reaction? Not a harsh word, not a dirty look. Not even a hint of the reaction you’d think Southerners might still have for Yankees of whatever stripe. I was treated with perfect professional politeness. Greenville’s commitment to emulating the Red Sox, it turns out, isn’t as complete as they might think. It still has worked out well for the Drive so far. This is their 13th straight season as a Boston affiliate, and their current agreement runs through 2020, making it at least 15. For their sake, I hope it endures much longer. It would be a pity to have a Fenway replica as someone else’s affiliate, or to revamp the dimensions to something more generic. It would be worse if they felt compelled to build something entirely new after a short ballpark life, like certain major league teams I could name. We saw one of those teams the next day, and I will double back to them. First, I will skip ahead two more days to their own affiliate, the Rome Braves. Rome is another Low-A club in the South Atlantic League, tucked into northwest Georgia about 50 miles from Atlanta. No points for guessing Rome’s affiliation. The matching nickname is not remotely a surprise. Atlanta’s Double-A farm team is the Mississippi Braves. Both their entries in Rookie ball are Braves, as is their team in the Dominican Summer League. Their Triple-A team just changed from the Gwinnett (Georgia) Braves to the Skippers, but this may have been a marketing move attempting to reverse a long-term skid in attendance with a snazzier name (e.g. the Jacksonville Jumbo Shrimp, New Orleans Baby Cakes, Binghamton Rumble Ponies, et al.). Their High-A club, the Florida Fire Frogs (see?) has been in Atlanta’s orbit for just two years, so maybe they haven’t gotten around to a clarifying name change. That’s merely at Smokies level, though, not Drive level. Rome would need something rather stronger to act the truly loyal appendage to the Atlanta Braves. Blaring the “Tomahawk Chop” music through the PA at high-leverage moments barely advances the case. You expect that with Braves. What I didn’t expect was the “Steal a Base Race.” In between innings, a kid picked from the crowd is given 20 seconds to run across the outfield, grab a base left on the grass, and return to the starting point for a prize. It’s a pretty standard minors-style activity—and it’s also exactly what I’d seen two days earlier with the big-league Braves at SunTrust Park. Only the little kid in Rome won, and the high-school runner in Atlanta lost. Imitating your parent club’s promotional games is suggestive, though perhaps coincidental. The middle of the seventh was harder to explain away. The song, of course, was “Take Me Out to the Ballgame.” The rendition used was exactly the one used at SunTrust Park two days earlier. You couldn’t miss this because the tempo was very slow, making singing along a bit of a pulmonary endurance contest. My lung capacity was equal to the task, but by the final notes, the pattern that had been emerging element by element was complete in my mind. This trend probably has existed longer than I’m making it sound. It was, after all, a dozen years ago that Greenville built Fenway South to lure in a Red Sox affiliate. My minor league sample size on previous trips was small, and teams like the Louisville Bats and Erie SeaWolves might be resisting the tide. But the Rule of Three got my attention and let me see which way the tide was flowing. Farm clubs must believe they’re getting substantial, tangible benefits from leaning more heavily on their parent clubs, benefits greater than the cost. Such a pose of dependency gives the major league teams an advantage in negotiating affiliation extensions. They can shrug off the connection easily; the minor league team has signaled it cannot. Maybe it’s hard to resist a link to history, as the Smokies thought with the Cubs leaving “1908” forever in the past. Maybe you’ll pay any price and imitate any ballpark when trying to replace a departed team, as Greenville thought last decade. Maybe the Rome Braves are trying to replicate some genuine big-league experiences that don’t involve spending genuine money. I hope it keeps working out for them. The centerpiece of the baseball tour was our first visit to SunTrust Park, ostensibly in Atlanta but actually in Cumberland, Georgia. The controversies over the abandonment of Turner Field, and the location and funding of the new stadium, were in my mind. I came to this game doing something I had never before done on these tours: I was explicitly comparing a ballpark to its predecessor. Not even when I first visited Citi Field, several years after it supplanted Shea Stadium, had I done this so overtly (except for the airplanes overhead, and that was a draw). When I made my first and last visit to Turner Field two years ago, I mused openly about the wisdom or folly of the impending move. You may revisit my observations here, but I’ll sprinkle them in as I tell the tale of our adventure with the new park. When the move was proposed, a leading justification for it was that reaching and leaving Turner Field was a gridlocked bane, and SunTrust Park would be much more accessible. Getting to Turner Field on our 2016 Grand Tour wasn’t so bad, but leaving it had been as bad as advertised, and this on a Sunday afternoon. The new facility didn’t have a high bar to clear. The quarter-hour delay we endured on the beltway north of Atlanta late on a Wednesday morning was not an auspicious start. Once we got into Cumberland, things did not improve. The area is virtually one extended office park, with parking lots you cannot use and no place to pull over and either ask for directions or call up a map on your navigation app. There were plenty of signs for walking and biking trails, the Cobb Energy Centre (yes, spelled as in “Rogers”), and Cobb Travel and Tourism. There were also some signs for Braves parking lots. Just not ours. The garage where we had pre-purchased a space is apparently a supplementary lot, not part of the main complex. There are no traffic signs directing fans to it as there are for the others. We had to look up its address, drive there, then drive to its actual entrance, which was on the opposite side from its street address. Why this supplementary lot was opened for a Wednesday matinee that drew a crowd about 9,500 short of capacity never became clear to us. Still, we were there. The time lost finding our lot cut down on the time available to explore the ballpark. We did make a circuit of the park, finding three of the statues it sports. Two are for Warren Spahn and Phil Niekro that were transplanted from Turner Field. The third, of Bobby Cox, was a new work and not nearly as dynamic as the mid-throw poses of Spahn and Niekro. Perhaps the sculptor didn’t think to portray Cox in mid-rhubarb with an umpire, on the verge of getting ejected. Hank Aaron has a statue there, of course, but it’s inside at Monument Garden. This area serves as a Braves museum and Hall of Fame of the type many stadiums now boast. The statue is newly commissioned; the one he had at Turner Field was left behind. The Turner statue of Ty Cobb did not make the move either, and it got no replacement. Our seats were in right field, in a home run porch of sorts below the Chophouse, an informal restaurant with servers tending to the spectators below. It was somewhat akin to Club 755 at Turner Field, where I splurged for Paul and me to eat before that game two years ago. My food was perhaps not as consistently good as last time. The pulled pork sandwich was mediocre, but the curly fries were very good. My mango lemonade was outstanding, except for being too small. It stayed cool due to a pleasant innovation: the refrigerated cup holders built into the dining shelf in front of our seats. These holders also proved helpful, on that hot day, in cooling off our overheated electronic devices. The players must have noticed the heat as well, because they played a wonderfully expeditious game. I have filled these electronic pages griping about how long games have gotten, so it’s time to hand out praise. This game, and two of the four others we saw on the tour, came in below two and a half hours. The Braves and Mets were done in two hours, 12 minutes. It wasn’t limiting mound meetings that gave us this brisk pace. It was Mike Soroka and Jacob deGrom. Just like me to buy home-run porch seats for a pitcher’s duel. The double no-hitter lasted until one out in the home fourth, broken up by Dansby Swanson. He came home on Freddie Freeman’s single and a Brandon Nimmo misplay in the outfield; it was not scored an error. Mike Soroka’s no-no lasted six innings, and I thought for a time that I could be writing an addendum to my piece on pitchers getting pulled from no-hitters. Alas, as rain sprinkled down for the first and only moment that day, Michael Conforto opened the seventh with a grounder deep to short. Swanson had no chance to throw him out. This was déjà vu on two levels. Our last big-league game featured Masahiro Tanaka hurling five and two-thirds perfect innings. The first game on the current trip had featured Duncan Robinson of the Smokies pitching a no-hitter for five and two-thirds. Bonus scouting report: He works fast and throws strikes. What’s not to love? Soroka beat them by one out for the longest no-hit effort I’ve ever seen in person. Soroka got hooked one batter later, after 74 pitches, leaving to the ovation he had earned. His successors held in the seventh and eighth, but Mets reliever Jerry Blevins could not contain Freeman. His eighth-inning homer landed, naturally, nowhere near us in the homer seats. Braves closer Arodys Vizcaino stumbled, putting the tying runs in scoring position, but he got a pop-out from the sagging Jay Bruce. Atlanta had a quick and tidy win. That was the last quick and tidy experience Paul and I had that day. We walked back to the parking garage, a quarter-hour trek at least. We got into the car and waited for a gap in the traffic to pull out. There was no gap. There was no movement. For the next 37 minutes, the cars behind us, waiting to drive out, were stuck in place. It took a further 10 minutes after that for us to pull out, get in the queue, and reach the garage’s exit. That’s when we entered the traffic jam outside. I cannot recount everything, from the heavily dented black door abandoned by the side of the road, to the truck pulling in front of us from a dirt divide and spewing clouds of dust at us, to the two times traffic on Interstate 75 stopped cold. It was more than half an hour between leaving the garage and finally reaching a speed of 50 miles per hour, my standard for the traffic jam being past. Technically, it wasn’t as long a jam as we suffered two years ago, measuring from parking lot to I-75, but add in the wait inside the garage and, jeez, it was an hour and a third before I felt we had escaped. SunTrust Park is probably a better place to watch a ballgame than Turner Field, but the improvements are largely incremental. You don’t need a new stadium to have refrigerated cupholders, or FIP, groundball percentages, exit velocities and launch angles given on the scoreboards. (PNC Park was giving horizontal and vertical breaks on pitches back in 2013. SunTrust isn’t that cutting-edge.) The Battery, the commercial zone built on the pedestrian approach to the field, is probably nice, if artificial, and if you’re coming to the games for reasons other than the games. Add in the traffic problems, though—the leading reason given publicly for the relocation—and SunTrust gives away all those gains and much more. Since my visit, I have recommended to people I know that they not attend a Braves game at SunTrust. One of those people is a neighbor who will soon be 82 years old. If he were stuck in a sweltering parking garage for 40 post-game minutes, one A/C on the fritz could mean the end of him. It feels melodramatic, but a ballgame simply isn’t worth the risk. The Atlanta Braves spent $800 million, and Cobb County $400 million, to build a stadium that is a downgrade from the 20-year-old facility that could have lasted the team another generation. In Lewis Carroll’s Through the Looking-Glass, the Red Queen declares, “It takes all the running you can do, to keep in the same place.” The Braves made such a mad dash, and fell behind. My only remaining question now is whether Tropicana Field down in Tampa Bay is worse, traffic miseries and all. I might almost be ready to go down there and conduct the experiment. Somebody please stop me, before it’s too late. Having given our odometer a vigorous workout, as opposed to the fatigued march of years past, we wound down the tour where it began, in my home town of Asheville. The Low-A Asheville Tourists had a Saturday game, complete with the third bobblehead giveaway of our trip, and we took care to get to McCormick Field early enough to assure we’d get the bounty. We were almost too late anyway. The traffic wasn’t Atlantean, but it was heavier than I had ever seen for a Tourists game. The line at the gate stretched something close to a city block, again unprecedented for Asheville. The only time I recall a longer line at a baseball game was two years ago for a Yadier Molina jersey giveaway at Busch Stadium. Others were roughly as long, but all for major league games, not a bush-league contest four levels below The Show. What prize could have prompted this turnout? What immortal face, jangling on a spring, could have drawn such a covetous crowd? You will search the databases of FanGraphs and Baseball Reference in vain for him, so try IMDb instead. That’s where you’ll find Crash Davis, the minor league veteran played by Kevin Costner in Bull Durham. Fans of the movie probably see where this is going. Davis got cut by the Durham Bulls before he could reach the mythical minor league home run record he was chasing—but got picked up by Asheville. It was at McCormick Field, in a Tourists uniform, that he hit his record-breaking 247th round-tripper. That is why, 30 years plus one day after Bull Durham’s theatrical release, there was such a long line outside McCormick Field, including plenty of folks too young to have seen the movie in 1988, myself included*. That’s why the game program was made up like an issue of The Sporting News (complete with address label to Annie Savoy), with Crash and “247!” on the front cover. That’s why real-life Sporting News writer Ryan Fagan wrote an article celebrating Crash’s achievement for the program, which you can read right here if you don’t have that issue handy. * Didn’t fool anybody with that, did I? This being the minors, where there is no such thing as over-promotion, the Tourists went several steps further. 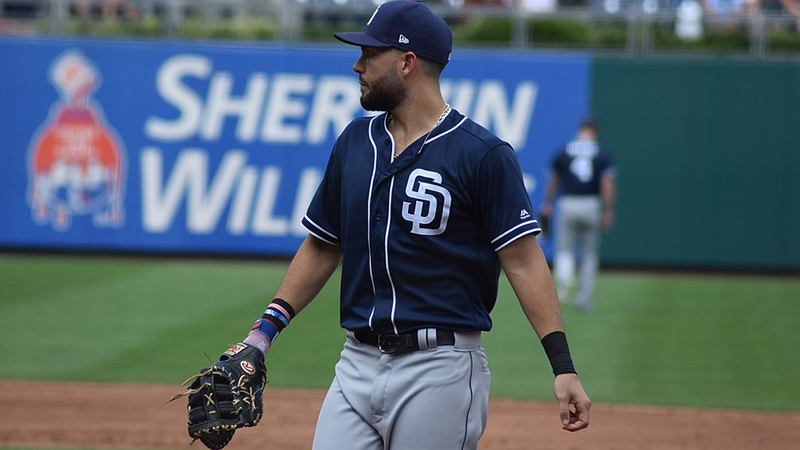 The team wore 1988-era uniforms, with special “247/Homeruns/Crash Davis/McCormick Field” commemorative patches on the right shoulder. The Tourists catcher for the game was listed in the lineup, and announced over the PA, as Crash Davis. He even had “Davis” on the back of his jersey, which doesn’t carry names on the Tourists. “Crash” was actually Nic Motley, who at 6-foot-3 is two inches taller than Kevin Costner. They make catchers big these days. Sadly, we will never know what would have happened had “Davis” hit home run number 248 that night. Motley’s best effort was a double off the base of the right-field wall. He also got hit by a pitch, which I suppose is better than the mascot getting drilled. The game was the longest of the tour, and for once I did not mind. The teams hit two homers apiece, none of which hit bovine signage that would win anybody free steaks. (There are two signs at McCormick that win attendees something if hit, but neither was dented.) Asheville closed a 7-2 deficit to 7-6 in the seventh but could not get that final run and lost. That probably fits the tone of the movie itself, so I can accept it. My other two sections had lessons I learned from my travels, so after Crash Davis Night at McCormick Field, what do I believe? Well, I could give you a rundown…but Crash Davis’s list is more interesting than mine, so I will leave it at that. Investopedia for knowing exactly what “vertical integration” is.